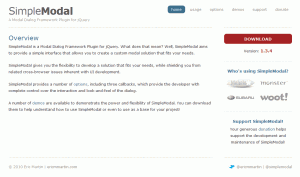 SimpleModal 1.3.5 is now available for download. The transient option, which was added in 1.3.4, was renamed to modal because transient is a reserved word and was causing issues. Also, the reference to $.support.boxModal was changed back to $.boxModal to remain compatible with older versions of jQuery. Also, if you have any feedback or input on what you'd like to see on the new site, please let me know. I want to make it as useful as possible. If you have any questions regarding SimpleModal, I strongly suggest using stackoverflow. If you find any bugs, please report them on the issues page. Thanks for the simple modal. I have a problem in IE 8 when I want to show 2 modals in one page. It doesn't show anything error. Something to work on in the future for the contact form, in IE, when the field validation message appears, it does cut off the buttons at the bottom. In firefox and chrome it works fine, though. A little disappointed that contact form is installed on wordpress platforms, but few hours later worked for me too. Why, when I use ckeditor in the modal box, this ckeditor is uneditable ?? I have been using Simple Modal for some time, and have found it to be very effective. I am a Front End Dev for some high traffic sites (NYTimes Real Estate, HGTVs FrontDoor ... and others ). A feature I would love to see is the ability to adjust H and or W based on changing content. For example when form validation occurs and a error message increases the height. I would be great to have a method .resize() which would recalculate placement and heights for the DOM elements involved. Thanks so much and keep up the good work. How would you incorporate this into a list of different people, so when you clicked on their names, it would change the address to that person. I guess you'd have to pass the email address to php or js or pass the name and have a check with appropriate email addresses in the js or php?? the ability to call an iframe totally saved me today. thanks for a great plugin! But, I have problems with overlay and modal position update on Ipad. The simplemodal-container don´t update position on center of screen when you scroll the page. Anyone have the same problem? Very thanks. Great tool. I wonder if you or anyone knows how to dynamically scale the modal box depending on the content? Right now, if the content is larger than the predefined minHeight, it is displayed outside the box. I can increase the minHeight, but when there is only one line of content you end up with a lot of white space. Any thoughts? 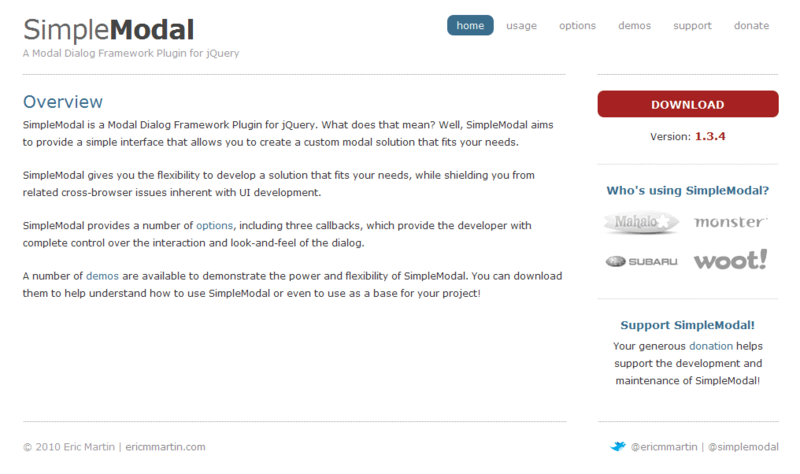 we are using jquery (V) 1.4.3 and simple modal (V) 1.3.5 in our application. the simple modal is working fine in FF browser, but it breaks in ie browsers (ie7 and ie8 compatible mode). Only it is displaying scroll bar. Can you help me to fix this issue? There was a change in jQuery 1.4.3 that changed the way the container height is being calculated. I am looking into a fix. Now i have made the following changes in 1.3.5 and 1.4. it is working fine. But if any close button will come on wrap layer, this solution will not help. @Allwyn - I released 1.4.1 today; can you see if it fixes the issues you were having? Thanks Eric, It is working fine.